Written by a leading expert in interior design, Kitchen and Bath Design uses three-dimensional drawings and corresponding photographs to deliver valuable information that is critical when it comes to planning, designing, specifying, estimating, building, pricing, or evaluating a kitchen or bathroom. Whether they're working on a new or existing space, professional designers can apply the lessons learned from this current andaccessible resource to masterfully take on all kitchen or bathroom projects—from the simplest to the most highly challenging. Mary Fisher Knott, CID, is owner of Mary Fisher Designs, where she specializes in residential space planning, design services, and ergonomics. She has developed nationally published multimedia and has written presentations on space planning, kitchen design, ergonomics, lighting, energy efficiency, and conservation programs, as well as five books, numerous articles, and a full-length video on kitchen design. She is a member of Residential Space Planner International (RSPI), a Certified Agingin Place Specialist (CAPS), and an Allied Member of ASID. Who Are Residential Space Planners? 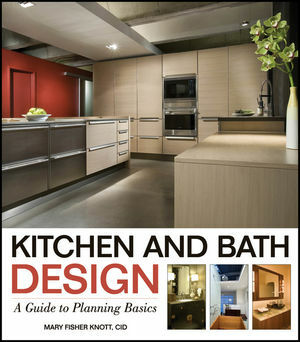 Planning Procedures in Kitchen and Bath Design. 2 Basic Construction Methods for Kitchens and Baths. 3 Universal and Ergonomic Design. Ergonomic Solutions for Kitchens and Baths. Industry Guidelines for Countertop Work Space. Spatial Clearances and ADA Guidelines. Integrating the Kitchen with Living Spaces. Codes, Clearances, ADA and Universal-Design Bathrooms. 9 Electrical and Lighting Basics. How Electrical Power Is Delivered to the House.